Currently, approximately a quarter of the world’s population lives in countries with highly restrictive abortion laws. Recent estimates suggest that around 25 million unsafe abortions are undertaken each year worldwide (Ganatra et al. 2017). While the health costs of clandestine abortion have been documented in a range of settings (Grimes et al. 2006), credibly documenting the impact of abortion legislation on women’s health has been challenging, given difficulties in constructing comparison groups for countries undertaking abortion reform, and a lack of availability of universal health records in many settings. Our recent research (Clarke and Mühlrad 2018) presents the first population-level evidence of the impact of sub-national variation in abortion laws on maternal morbidity, as well as maternal mortality, using the universe of administrative health records from Mexico. We focus on a time-period and national setting in which considerable within-country reform of abortion policy was undertaken, with both a sweeping legalisation in the Federal District of the country (Mexico DF)and increasing sanctions on (illegal) abortion in other regions of the country. In this context, we are able to determine to what extent change in abortion laws, absent other major contraceptive revolutions, impact health indicators for the population of affected women. These reforms, and particularly the Mexico DF reform which legalised abortion up to 12 weeks of gestation in any circumstance,were of considerable importance. Since 2007, approximately 150,000 women have accessed free or subsidised early-term abortion in Mexico DF, compared to 62 legal abortions (available in restrictive conditions) in the eight years prior to the reform. We combine the state-level variation over time resulting from legislative changes in abortion law with high-quality vital-statistics data, recording over 30 million births, 18,400 maternal deaths, and 46 million inpatient cases for causes related to maternal health. Using administrative records from the judiciary, we additionally document the impact of Mexico's abortion reforms on legal sanctions handed down to women. We begin by benchmarking the reforms’ impacts on fertility and find—in line with literatureon the fertility impacts of abortion reform in other settings—that legalisation reduced birth rates by approximately 5–6%. We generally observe little evidence to suggest that the posterior regressive law changes had considerable impacts on fertility. Turning to maternal health, we find clear evidence pointing to a reduction in maternal morbidity following the introduction of legalised abortion, across a range of methodologies. This is driven by a sharp reduction in rates of haemorrhage early in pregnancy, which falls immediately by approximately 40%, along with a more gradual reduction in abortion-related morbidity. We observe little evidence to suggest consistently estimated, statistically significant changes in morbidity following increased sanctions on (illegal) abortion. In general, we observe impacts on maternal mortality that agree with those on maternal morbidity. However, estimates are considerably less precise, suggesting that when examining only impacts of abortion law on maternal mortality, analyses fail to account for the full weight of abortion reform on women’s health. Figure 1 documents our estimates of the impact of the passage of abortion law on rates of haemorrhage early in pregnancy, comparing areas which either legalised abortion (top panel) or areas which increased sanctions on abortion (bottom panel) to areas which did not alter their laws. In the case of Mexico DF’s legalisation of abortion, an immediate and sharp reduction in rates of haemorrhage was observed in the year of the reform and in all following years, which is consistent with the moving of hitherto clandestine (unsafe) abortions to safe and sterile clinics, with resulting improvements in women’s health. We observe no evidence to suggest that increasingsanctions on (already illegal) abortion acts as a disincentive, or has any follow-on impacts on rates of haemorrhage (bottom panel). Similarly, when considering ‘abortion morbidity’ (any woman arriving in a hospital with a maternal complication coded as some type of spontaneous, medical, or other abortion), we observe a considerable reduction in rates of maternal morbidity following the provision of free and legal abortion (top panel of Figure 2), and no impact of increasing sanctions on women’s health. We next examine whether there is evidence of changes in the likelihood of being sentenced to prison for having an abortion, or in the length of prison sentences received, based on the passage of the abortion laws. That is, we examine the universe of all custodial sentences handed down by the Mexican judiciary. We observe that there is a sharp reduction in the number of prison sentences in Mexico DF following the reform (in line with the legalisation of abortion), and no significant change in sentence length handed down in Mexico DF. 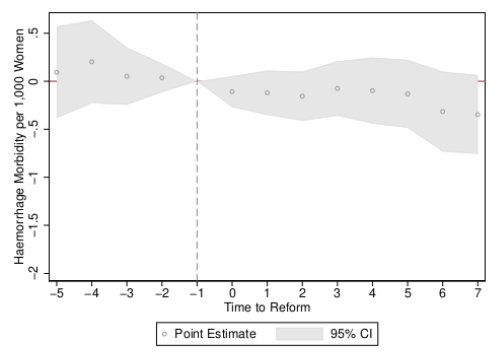 Importantly, we observe evidence of a dual impact in regressive states. We observe mixed evidence pointing to a slight reduction in the number of prison sentences handed down, falling by 1.374 cases in weighted regressions (compared to a mean number of sentences per state and year of 1.819). In terms of sentence length, we observe a considerable increase of between 4.1 and 5.3 years, depending on the estimated specification. 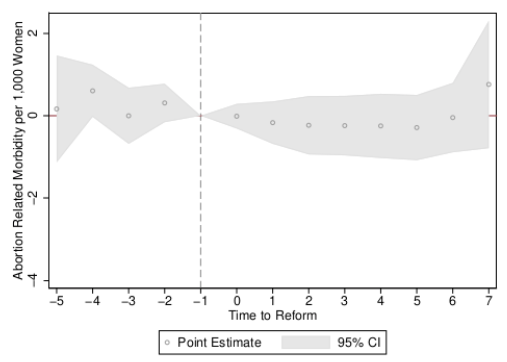 Thus, these results suggest that while the changes in law did not necessarily always prescribe a change in prison sentences, there is a detectable increase in the length of prison sentences observed in administrative data, among those who were sentenced to prison. Evidence from other settings has documented a willingness to travel over a significant distance to access abortion providers (see for example Cunningham et al. 2017), and we observe a similar phenomenon in the case of legalisation of abortion in Mexico DF. While about 75% of abortions provided by the state health clinics were for women who reside in Mexico DF, the remaining quarter wereprovided to women from all regions of the country, though largely (24%) to women residing in nearby Mexico State. In Figure 3, we document rates of access per 1,000 women of fertile age. This rate was 5.2 per 1,000 women in Mexico DF, versus 1.1 per 1,000 women in Mexico State, and 0.1 per 1,000 women or lower in other states. 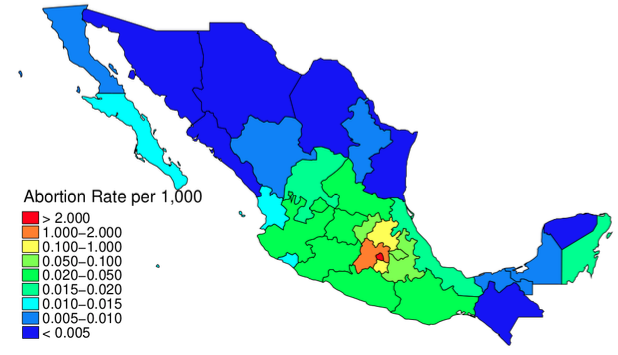 Despite the geographic spread, our results suggest that abortion legalisation’s impacts on fertility, morbidity, and mortality were concentrated on residents of Mexico DF, in line with muchgreater intensity of use in this district. 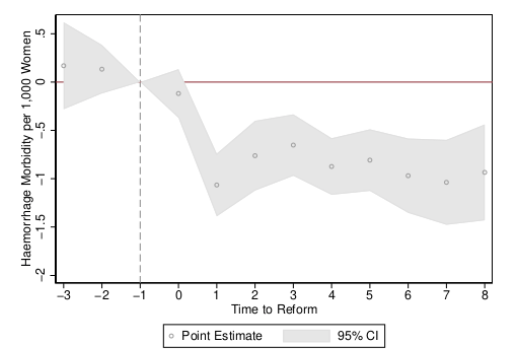 In the presence of spillover effects to neighbouring states of the legalisation of abortion in Mexico DF, our estimates would suffer from a downward bias. If this is the case, our estimates are likely a lower bound of the effect of abortion legalisation. We examine the effect of abortion laws on the use and knowledge of modern contraception and self-reported sexual behaviour using survey data of a panel of women. 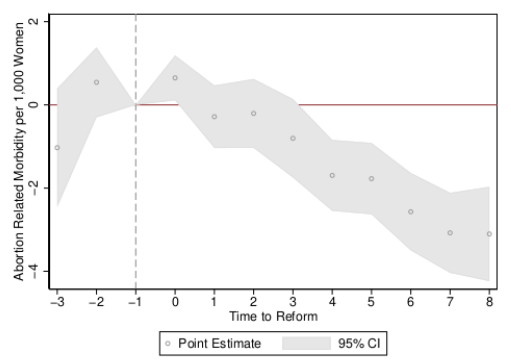 We find very little evidence to suggest that the results of the abortion reform flow from an increase in contraceptive knowledge in reform areas, or that there are changes in risky sexual behaviour as a result of the reform. We find close to zero effects for change in contraceptive use and knowledge, and an insignificant reduction in the number of sexual partners reported. Similarly, we do not find that regressive changes in abortion laws cause women to seek additional information or be more likely to use contraceptives, or change sexual behaviour, as proxied by the number of sexual partners, compared to areas that were not subject to a regressive reform. The results of this paper are becoming relevant once again, as a number of countries revisit abortion legislation and attempt to make considerable changes in constitutions and penal codes. Among others, legislative reforms have been undertaken or attempted in Ireland, Argentina, and Chile in 2017–2018, focusing on legalising abortion in certain circumstances, and increased restrictions have been enacted or proposed in Poland and a number of US states (Conti et al. 2016). This paper documents that these policies are likely to have a considerable impact on women's health and well-being. Our results show that, at least in the case of Mexico, the legalisation of abortion had immediate impact on the likelihood that a woman would visit a hospital for maternal health causes, thus avoiding nearly 10,000 hospitalisations, while finding very little evidence to suggest that increasingsanctions on abortion would have similar effects on women’s health. Clarke, D, and H Mühlrad (2018), “Abortion laws and women’s health”, IZA Discussion Papers 11890, IZA Institute of Labor Economics. Conti, JA, AR Brant, HD Shumaker and MF Reeves (2016), “Update on abortion policy”, Current Opinion in Obstetrics and Gynecology 28: 517–521. Cunningham, S, JM Lindo, C Myers and A Schlosser (2017), “How far is too far? New evidence on abortion clinic closures, access, and abortions”, NBER Working Paper 23366. Ganatra, B, C Gerdts, C Rossier, BR Johnson Jr, Ö Tunçalp, A Assifi, G Sedgh, S Singh, A Bankole, A Popinchalk, et al. (2017), “Global, regional, and subregional classification of abortions by safety, 2010–14: estimates from a Bayesian hierarchical model”, The Lancet 390: 2372–2381. Grimes, DA, J Benson, S Singh, M Romero, B Ganatra, FE Okonofua and IH Shah (2006), “Unsafe abortion: The preventable pandemic”, The Lancet 368: 1908–1919.